In 1968, Chicago made headlines for the ferocity of its police response to protesters at the Democratic National Convention, prompting outrage in the art world. Some artists pulled their shows from the city and called for a boycott until the mayor left office. But others responded artistically, creating new works and even full exhibitions in reaction to the political and social issues raised by the summer's events. Despite the city's sometimes notorious political and social history, art practices that challenge authority have thrived in Chicago. Art Against the Law examines the creative tactics of the city's activist artists and their ways of addressing the broad definitions of the law--from responses to excessive policing to inequities in public policy. These include creative forms of protest, rebellion against the law through illegal art practices, and using the political system itself as an art medium to alter existing laws. The essays and conversations in this volume also address the boundaries between art and creative activism and question whether lines should be drawn at all. Through these texts and interviews, Art Against the Law proves that creative imagination can be formidable in challenging the status quo. 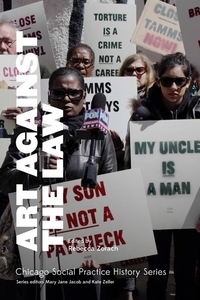 Art Against the Law is part of the new Chicago Social Practice History series, edited by Mary Jane Jacob and Kate Zeller in the Department of Exhibitions and Exhibition Studies at the School of the Art Institute of Chicago (SAIC).